xiii+219 pages with diagrams and index. Octavo (8 3/4" x 5 3/4") issued in blue cloth with gilt lettering to spine. Translated from the German Das buch vom Opfer (1965) by P H Clarke. 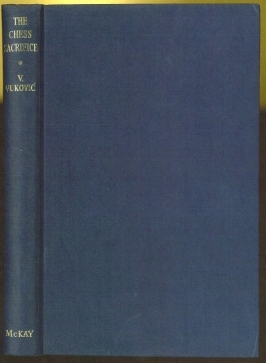 (Betts:19-32) First American edition. 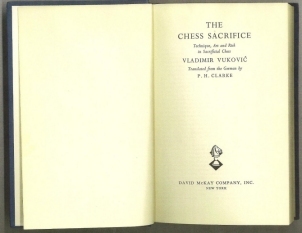 The author attempt to clarify the concept of sacrifice in chess, "to present and explain the numerous types of sacrifice, to indicate the grades of merit which lead up from sacrificial technique to art, and, finally, after a review of the entire subject to arrive at a new and deeper insight into it". He also continues the work begun by Spielmann in the Art of Sacrifice in Chess, covering the subject in greater detail and definition. 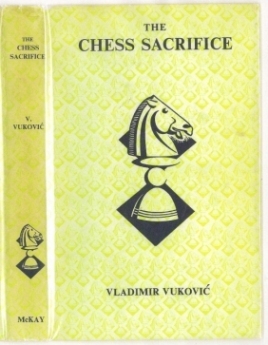 Main sections: The elements of sacrificial techniques, Functional elements in sacrifice, Sacrifices related to the material sacrificed, Typical sacrificial formations, Sacrifices on specific squares, Sacrifices in various phases of the game, The Positional sacrifice, Compulsion and time in Sacrifice, Psychology in Sacrifice, Risk in Sacrifice, Luck and Misfortune in Sacrifice. These topics and their various facets are examined with illustrative positions and 51 complete games. Includes indexes of players and themes. Head page ends dusty. Jacket price clipped else a very good copy in like jacket.